On March 3, 2006 20 year old Matthew Snyder was riding in the gun turret of his Humvee in the Al Anbar province of Iraq, when he was involved in an accident. The Humvee rolled over and Matthew was killed. 7 days later Snyder’s family held his funeral in his hometown in Maryland. Along with the family, friends, and community members who showed up to pay their respects to Lance Cpl. Snyder, there were a few protesters from the infamous Westboro Baptist Church. Their message is disgusting, their tactics are reprehensible. Everything they do is an attempt to get more publicity for their distorted view of Christianity. Fred Phelps and his daughters Shirley Phelps-Roper and Rebecca Phelps-Davis are three of the worst people on the face of the planet, and I am not exaggerating my feelings for effect. They truly are scum, and honestly if they were on a plane to protest that fell out of the sky and they didn’t survive the world would be a better place. Anyway back to the story of the WBC protesting the funeral of Lance Cpl. Snyder. They showed up and did what they do everyday, of course the family was disgusted and outraged, as they should be. Snyder’s father Albert sued the church for intrusion and intentional infliction of emotional distress. The case went to trial and the jury found in favor of Mr. Snyder and awarded him $10.9 million in damages. The Phelps family (who are mostly lawyers by the way) appealed and the Fourth Circuit Court of Appeals overturned the verdict citing the Phelps’ first amendment protections. Earlier this month the United States Supreme Court agreed to hear the case, and it will be very interesting to see what they have to say. The most recent twist in this case came yesterday when the 4th circuit court ordered that Albert Snyder has to pay the legal bills of the Phelps family, which so far are $16,510. This is apparently standard practice in lawsuits, and for a good reason. If there is a possibility of you being required to pay the legal bills of someone you sue, chances are you are going to make sure you have a solid case before going ahead. Courts are full enough without frivolous lawsuits and a person should not have to spend thousands of dollars to defend themselves against a lawsuit without merit. Which brings me to the part that is probably going to make some people upset. I think that maybe for the first time in their existence, the Phelps family is completely right. Personally I think their actions could not be more wrong, but their legal argument is correct. The purpose of the First Amendment is not to protect speech that is popular. It is to protect the speech that is not. The Phelps family has the right to stand on our public streets and say what they want to say. It is that right that Lance Cpl. Snyder and thousands of his fellow soldiers, airmen, marines and sailors have given their lives to protect, and it is doing a disservice to them to try to take away the rights of someone just because we disagree with what they say. Great post, I can’t stand those scumbags. Your stance is commendable, not many people would have the balls to say what you said at the end even though it is sadly true. I’ll be looking forward to future posts. It most assuredly is NOT standard practice to award attorneys’ fees to the winner of a lawsuit. Not in the US. In England, yes, but here we have the “American Rule” which states that each side pays its own fees, unless the party behaved in extreme bad faith, and even that is rare. The other circumstance is when the suit is filed based on a statute SAYS the winner’s fees get paid by the loser. I have no idea what the 4th Circuit based this decision on, but if the judge who presided at trial didn’t find bad faith, and the Supreme Court thinks there’s enough of an issue to hear the case, it sure seems odd. I did a bit of reading on this, and the American Rule says that both sides pay their own unless a statute allows for collection of attorney’s fees. There are federal statutes that allow for the defendant in a civil case to collect attorney’s fees. I am not a lawyer, and it looks like you might be or at least know a bit more about the law than average. I was going off of what I read yesterday, and saw in several articles that this was a common practice in cases regarding civil rights. So I don’t really know what the complete truth is, but I would suspect it is somewhere in between. My main point is not that Mr. Snyder should have to pay the attorney’s fees for the Phelps family, but that the original lawsuit and the $11 million dollar jury award were junk. The awarding of legal fees just brought the issue to the fore. I was seeing lots of discussion about it, and the majority of it was from liberals (I am a liberal, not trying to attack people) who were saying that Phelps should be shut down, that we should have laws against what the WBC does, that he should have to pay the original damages to the Snyders, and it really bothered me. It also bothers me a bit that I am supporting the most disgusting family in America, but that is what free speech is all about. Damn, I think you are right. Is it possible that much of their travel expenses are being funded via 501C3 charitable deductions, then in essence laundered via their “church”? Say what you will about the teabaggers & their supporters, I’m fairly certain they are not masquerading as a charity. Found your site through a friend and really enjoy it- thanks! Just wanted to add that Bill O’Riley offered to pay the $16,500 in legal fees Mr. Snyder was charged with. If even someone on the conservative (wingnut) right feels it was out of line, maybe there’s something to it. While I support the 1st ammendment, even these crazy bastards, they could demonstrate elsewhere. I think these ‘Christians’ have definitely crossed the line. Much as I hate to admit it, you have a point. However. Their MO seems to be to target the grieving. From military casualties to the five little Amish girls*, no funeral seems to be safe from these hateful people. Seems to me a case could be made that they are stalking a particular group of people, just for the harassment quotient. Stalking is illegal in most states now, I believe. They do have a right to say what they want, and so did Nelson (?) who shouted out “You lie!” at the President. 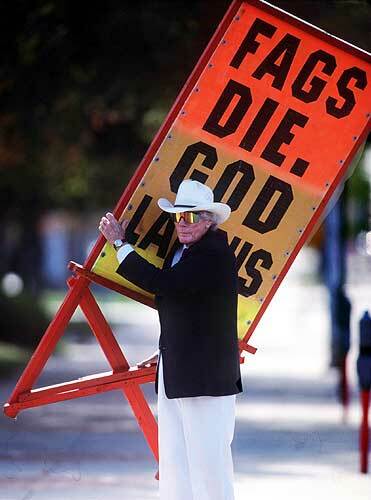 (Once upon a time, he’d have been officially reprimanded by Congress – not these days, unfortunately) That was not “the time” for him to call his President a liar, nor is a funeral the time or place for the Westboro Baptist Church to spout their illogical rhetoric. *(they might not have shown up at the Amish girls’ funerals, but they did plan to originally).